Abraham Lincoln once said, “Give me six hours to chop down a tree and I will spend the first four sharpening the axe.” Go into your first meeting sharp and ready. Presumably your partner has briefed you on at least the basics about his or her parents. So your job is to dig into the nitty gritty. Is your father-in-law a Civil War buff? Watch a documentary on Gettysburg, then ask him some questions. (Or drop the previously mentioned Honest Abe quote while discussing your own work ethic.) Does your mother-in-law have a sweet tooth? Find out what kind of treats she enjoys and bring a little something tasty to your first meeting as an icebreaker. My friend’s boyfriend comes from a Muslim family, so she added to what he’d told her by reading up. She went to dinner mindful of the traditions in his parents’ hometown of Karachi. Putting in a little pre-meeting legwork will pay off in the end. 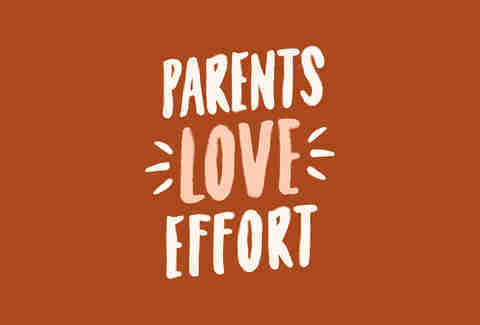 Parents love effort even more than they love those homemade kale chips you brought them. From the moment they meet you, parental units are evaluating whether or not you can take care of their special little guy or gal. The sooner you accept your role in their son or daughter’s life, the quicker you’ll become a part of the family. Why not define that role yourself? See if you can identify a missing link in the familial chain and forge your place in it. Are you the Entertainment Coordinator, organizing fun things to do when your in-laws visit to take the stress off your partner? Or the Kid Whisperer who gives parents a much-needed break to enjoy the party worry-free? My wife, an excellent cook, quickly won over my family by assuming the role of Master Chef. You can do this without ruffling feathers. My friend’s soon-to-be brother-in-law was horrified at how his potential Pop grilled steaks well done, but he bit his tongue (and his leathery steak). At the next cookout, he tactfully offered to let the man of the house chill on the patio while the younger man took over at the smoke station. When he served his future family their perfectly pink steaks, he became the hero they never knew they needed. They demanded he grill thereafter, and a decade later, my friend dedicated his book on barbecue to the bro-in-law. No matter how comfortable you may feel with these people off the bat, remember that you’re there by association. When it comes to family conflicts, first and foremost side with your significant other, of course. But in general, it’s best to stay neutral. If Cousin Dave has an annoying habit of burying everyone in his political opinions at Thanksgiving, don’t complain to the rest of the family about it. Follow your partner’s lead and let him or her diffuse any potential tension. They’ve dealt with Cousin Dave plenty of times before. In many ways a corollary to your neutrality above, you want them to know you’re upstanding in your personal life. 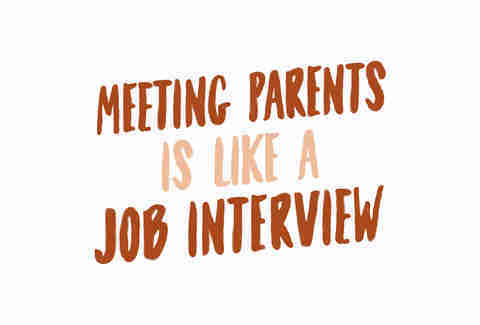 Meeting your special someone’s parents is a lot like a job interview. You dress nicely, try not to interrupt, and project confidence without being too cocky. And just as how you shouldn’t badmouth former employers during a job interview, it’s bad form to throw shade at your own fam while meeting your squeeze’s parents for the first time. Even a small complaint about your parents or siblings will cause your bae’s folks to wonder if you’re going to talk about them behind their back in the same fashion. They’ll wonder if this is how you rep your own flesh and blood, how much more mouthy are you going to be about in-laws? Again, treat it like a job interview. This should go without saying, but it’s important to remember “the three Ds” when meeting the parents for the first time: Dress appropriately, don’t bring up potentially dicey topics (religion, family issues, politics) unless prompted, and, for Pete’s sake, don’t be late. My sister’s ex-boyfriend was habitually late to every dinner reservation, movie outing, and birthday party where members of our family were in attendance. Needless to say, he’s no longer in the picture. Nobody’s perfect, and your future in-laws will learn to love you despite your mistakes. But it can’t hurt to start at 10 instead of 0 so you have some room to slip up. If the parents live far away, your first meeting will very likely be for a weekend or longer. 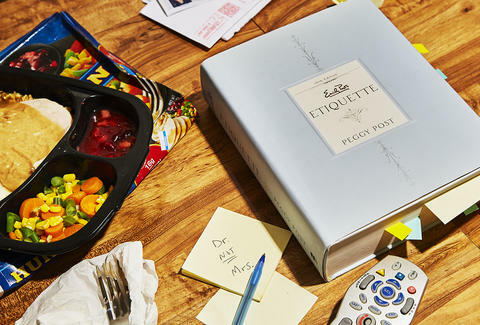 When visiting your guy or gal’s parents for an overnight stay, it’s important to remember that it’s their house. I had to sleep in a separate bedroom from my then-girlfriend when visiting her parents for years. (Basically until we moved in together.) It seemed hopelessly old-fashioned to me at the time, compounded by the fact that my mom had always been fine with us sharing a bedroom. But I respected my future in-laws’ wishes. I toughed it out, and eventually they were chill with their adult daughter bunking with another adult under their roof. In a way, it was fun feeling like my lady and I were back in high school having to pretend to the ‘rents that we’re totally chaste. Luckily the guest room bed wasn’t too lumpy. A friend once told me she was nervous about spending time with her girlfriend’s dad. She was perfectly comfortable with her gal’s mom -- they had an easy rapport, sharing vegan recipes and cute dog videos on social media. But Dad, a man of few words who preferred watching baseball or cable news to family time, was a tougher nut to crack. As a big proponent of the adage “happy wife, happy life,” I advised my friend to double down on her efforts with the mom and eventually Pop would come around. Sure enough, Dad realized that if he wanted to keep his wife happy, it was in his best interest to make an effort to get to know his daughter’s longtime girlfriend. My friend didn’t exactly become Dad’s new bestie, but her close relationship with her girlfriend’s mom eventually led to him letting his guard down a smidge. Remember: Your sweetheart’s parents WANT to like you. And every mom or dad loves someone who makes both their child and their spouse happy. Even if you screw up all of the above, have hope. I met my now-wife’s mother a few months into dating. With all the confidence of a man in his twenties, I went away thinking I had totally nailed it. 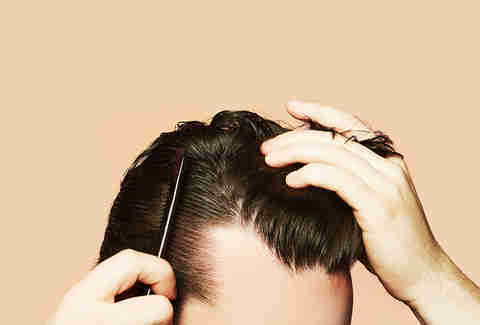 Later on I would discover, in fact, I had severely blown it. What I thought was confidence and a laid-back attitude actually came off as aloof and disinterested. 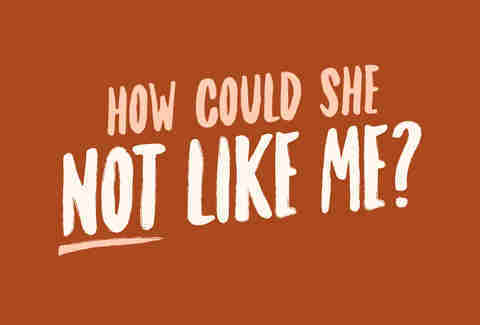 At first I was defensive – how could she not like me? (Ah, the hubris of youth.) But I realized that regardless of my ego, her opinion of me mattered more than my own. Since my girlfriend was a keeper, I needed to convince her mother I was, too. I made sure that my second (and third and fourth and fifth and sixth… ) impression was stronger than our initial meeting. The next time I saw my future mother-in-law, I immediately asked how she had been doing and inquired about a sick relative she had mentioned during her previous visit. From that moment on, it was off to the perfect boyfriend races: If there was a dish to be washed after family dinners, I was scrubbing it. If a door needed opening, I was holding it. But mostly I was making sure to be legitimately engaged and interested in what they said and did. Even if I went a little overboard, it was better than her mom thinking that I didn’t care. In time, I improved my standing. So that’s it. Everything you need to be somebody they cling to, instead of someone they’re stuck with. You’ve got this, Switzerland.